There’s a very cool color combo in this week’s Curtain Call Challenge over at Stacey’s Stamping Stage! 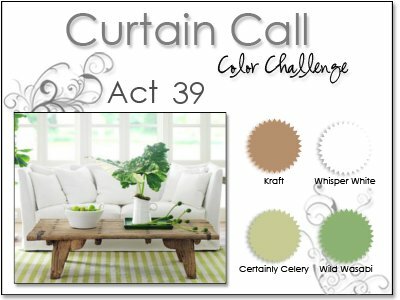 I enjoy these challenges, because they get me inspired by color combos that I wouldn’t normally use in my crafting! I substituted some similar patterned paper for the Wild Wasabi color, and I used Kiwi Kiss for the Certainly Celery. 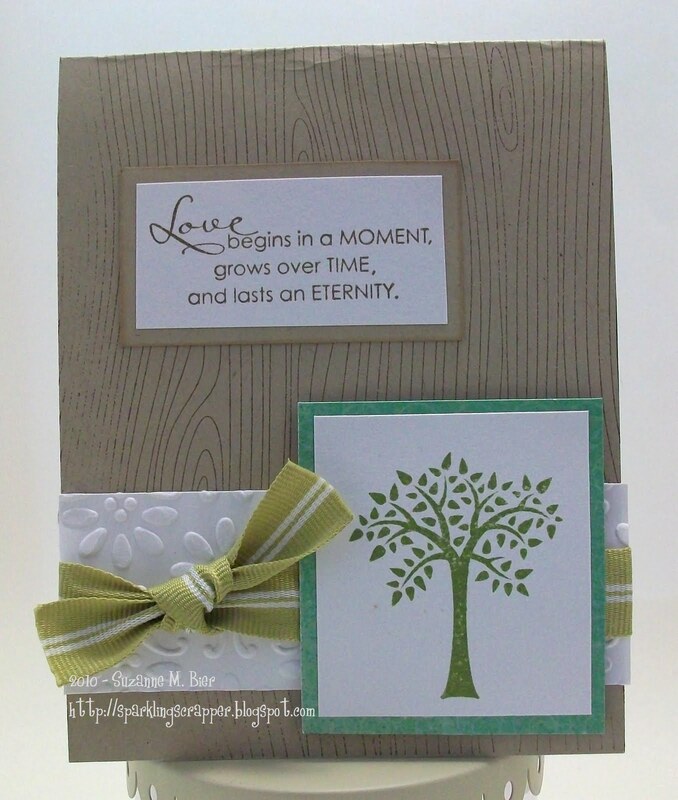 I stamped the tree image in Old Olive and the sentiment and woodgrain background in Soft Suede. I embossed a strip of white cardstock in the Big Shot and used some paper from Crate Paper’s Brook collection to mat the stamped tree image. The background stamp is from Stampin’ Up! (I still need to work on my inking technique for the really big stamps!) I used SU kraft cardstock for the card base. Thanks so much for visiting! Hope you’ll visit Stacey’s Stamping Stage this week and play along with the latest Curtain Call! pretty! love the embossed white cs with the woodgrain bg:) thanks for playing along at the Curtain Call, Suzanne! Suzanne, A very lovely card. That background stamp was perfect to go with the tree and that wording is beautiful. Very pretty card. I love that sentiment. Oh, I like your idea of the woodgrain stamp with the tree image. Nice! Thanks for joining the Curtain Call Crew this week! This is very pretty! I love the tree and the embossing! Great job with the colors this week!